Media and Contents: Hard cover, 224 full-colour pages. Advantages: Use of primary sources; good selection of photographs; inspirational artwork; well laid out format; interesting and pleasant narrative to read. 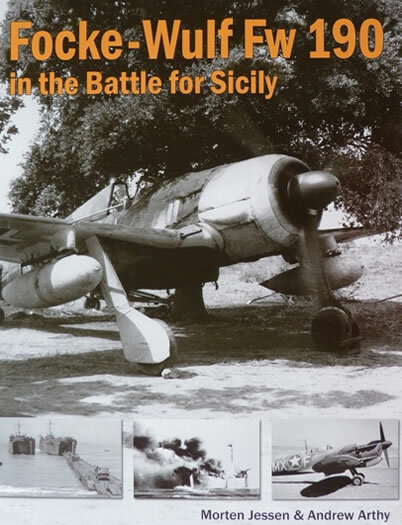 Conclusion: A superb book that covers all aspects of the valiant struggle of Fw 190s of Schlachtgeschwader 2 and Schnellkampfgeschwader 10 in the Battle for Sicily - 14 May 1943 to 2 September 1943. The Focke Wulf Fw 190 served on all fronts during WWII. Naturally there are some campaigns that are covered in more detail than others. This book looks to address the imbalance and describes the role of the “Butcher Bird” in the battle of Sicily, Sardinia and southern Italy during 1943. It was used as a fighter-bomber and took on an important role when it was first employed from a Sicilian airfield just eight days after the Axis defeat in North Africa. Their primary duties were against shipping and the already difficult situation was made worse when they had to face the invasion of Sicily on 10 July 1943. In trying to delay the Allied advance, the pilots faced many difficulties and lost many aircraft. Despite this they did enjoy some successes but of course in the end it was all in vain. Sources from both sides of the conflict have been used to tell the story and a very interesting one it is too. The book is slightly larger than A4, measuring in at a healthy 25cm x 31.5cm. Between the hardback covers are 224 pages of text, photographs, tables and illustrations. The latter consists of a collection of superb aircraft profiles from Claes Sundin and number 22 in total. 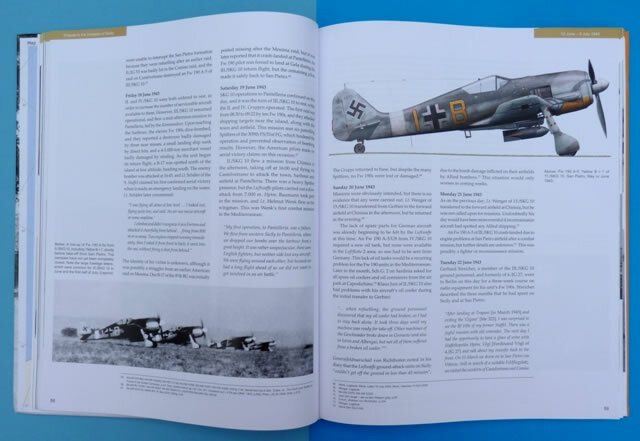 A variety of aircraft are represented including the Fw 190A, Bf 109G, and Spitfire Mk V.
Period photographs of these subjects are presented on accompanying pages so that the reader can put the artwork into context. Speaking of photos, there are nearly 150 of these. They have been carefully chosen to depict the environment, men and machines that took part in these events. The text flows freely and is very easy to digest. The narrative has been divided up into 8 chapters and each is finished with its own conclusion. These interim summaries work very well and help tie up any loose ends that the reader may have. Throughout the book are personal accounts from the participants themselves. They come from a range of backgrounds and add an individual touch to the occasion. The Appendixes are another welcome feature of this publication and also contain a wealth of information. Mission maps and other similar illustrations are sprinkled throughout the book and this provides a good graphical representation of the strategic ideas behind the campaigns. A comprehensive bibliography details the impressive number of primary sources used for the material gathered and this is backed up with an equally healthy dose of secondary sources. This book is a real eye-opener for those wanting to know more about the exploits of the Fw 190 in the battle for Sicily. The fighter-bomber role is not one that is seen in print all that often so this work is an important step in that direction. There is an enormous amount of information contained within these pages. The style of writing makes it all easy to digest and not once did I get bogged down in any technical repartee...so kudos to the authors here. This is one of those books that is hard to put down. The format is excellent and the coverage is exceptional. Recommended reading for anyone interested in these Italian campaigns or the Fw 190s of Schlachtgeschwader 2 and Schnellkampfgeschwader 10. Thanks to Air War Publications for the sample.